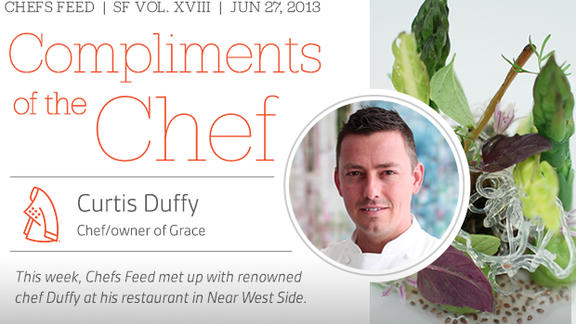 This week, Chefs Feed met up with renowned chef Duffy at his restaurant in Near West Side. CD: thoughtful progressive cuisine; grilled cheese sandwich. I brown the butter, which makes it extra special. My daughters also tell me I'm the best French toast cooker. My secret? I use Brownberry 12 Grain bread. CD: Demanding, fair, passionate, and a person of integrity. CD: We're excited about our entire spring menu and working towards our summer dishes. Right now we're doing a white asparagus, grilled ramp, glass noodle, and opal basil dish that will roll over to the first part of our summer menu. The incorporation of new ingredients and growth of different produce have sparked my attention. Coming up with new dishes is the part I get the most joy out of. CD: Michel Bras. I had the best meal of my life at his restaurant back in 2004, and there's not a single day that goes by that I don't think about my experience there. What makes him so special is how he finds so much inspiration from where he lives. My experience dining there was so impactful on my career. It changed the way I thought about food. CD: If you're going to a chef-driven restaurant where the chef is trying to tell a story with food, let him do it. If you're not allergic to something, then just give it a try; don't skip dishes. You may just end up leaving with a whole new outlook on that thing you used to not like during your childhood. CF: That being said, what don't you like? CD: Green bell peppers (because I hate the flavor profile) and shrimp (because I'm allergic to it). CF: Signature dishes: love 'em or hate 'em? CD: I don't want to be known for a dish, I want to be known for constantly moving forward and creating new things. That's why even after a dish gets a rave review, we end up having to pull it. This lends way for growth. CD: Food critics are my guests, and I care deeply about exceeding the expectations of every guest in my dining room, food critic or not. There are, of course, some critics I respect more than others, which is based on the quality of their writing alone; I appreciate a well-written review, whether I agree with their opinion or not. I would love for the younger critics to travel and experience more to expand their palates and gain a better foundation on which to base their opinions. CD: Chase the passion for what you do but don't chase it for money, because that will come. If you're not passionate about what you do, you don't stand a chance. CD: Thin. I like a burger I can eat. I don't want to have to smash it down. CD: Pizza burgers. My mom used to make them. It's a hamburger patty topped with cheese and pizza sauce on a bun.